Patagonia Frontiers designed and conducted the North Country Camps graduation trip. 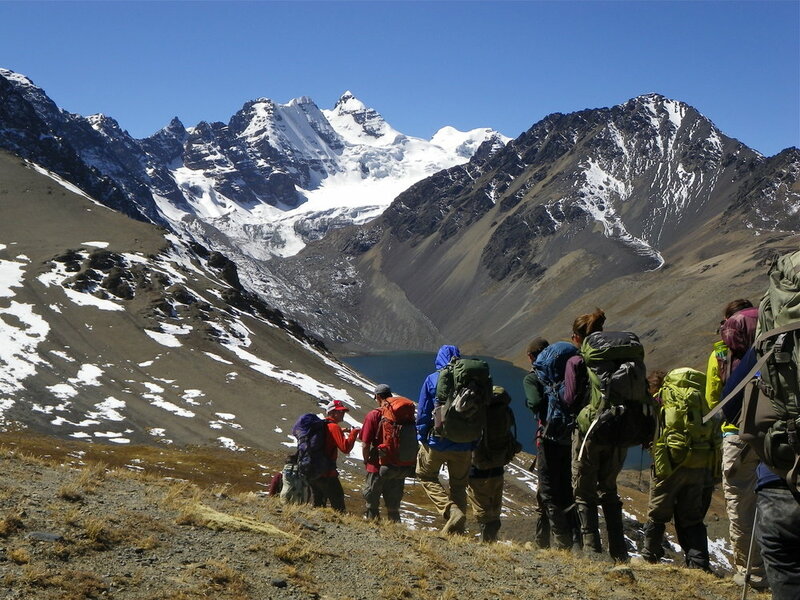 The capstone course is a 30-day trip named the Andes to Amazon Adventure®. The program was operated in 2011 and 2012 for 15 students per year. The graduation course allows NCC campers to draw on much of what they have learned with North Country Camps over the preceding eight years. The North Country Camps - Lincoln for boys, Whippoorwill for girls - offers to the urban and suburban child real wilderness adventure blended with the development of many athletic, creative and social skills; strong community spirit that emphasizes working together and doing your share; the freedom and accompanying responsibility of learning to make your own choices; and the sheer joy of simple, down to earth, outdoor living and playful fun. 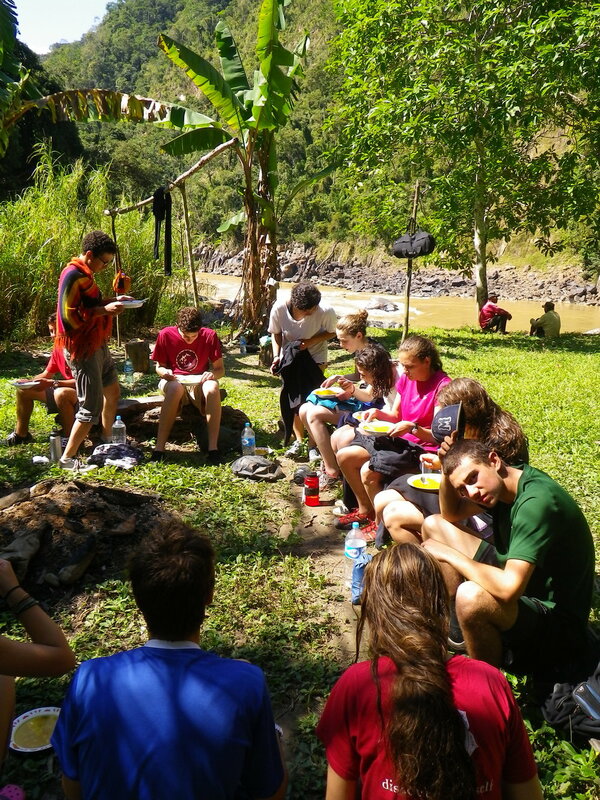 Andes to Amazon® student curriculum includes leadership and communication training, extended wilderness travel and navigation skills, basic first aid, expedition planning, introductions to mountaineering, flora, fauna and environmental studies, along with ample cultural opportunities. Each area of focus includes personal and group development, and reflection. Students tent camp, carry their own food and equipment, and prepare their our own meals for the duration of the trek, moving camp each day with classes and periodic rest days. It is common to pass remote home sites or encounter local shepherds along the way. Traverse the high cordillera, climb a peak, work with local schools, mountain bike down from the Altiplano, and explore the upper reaches of the Amazon basin. Mountaineering is practiced on the high, icy peaks of the Cordillera Real after trekking the wandering, isolated Incan paths of the Apolobamba Range in the natural reserve of the Kallawaya healers. *The trekking route is approximate. Alternative routes and travel/rest schedules may be used depending upon the educational and cultural opportunities that arise, and due to considerations including weather, route conditions, group health, skill level and teamwork. Day 1: Depart on overnight international flight from U.S.A. to La Paz, Bolivia. Day 2: Arrive La Paz. General orientation and gear check. Overnight Hostel, La Paz. Day 3: Acclimatization and expedition preparation day including a general orientation, equipment check, rations purchase and logistics review. Overnight Hostel, La Paz. Day 4: Early departure for Copacabana on Lake Titicaca with a visit to the Aymara and Catholic Sanctuary, Virgin of Candelaria, sight of Bolivia’s largest yearly religious pilgrimage. Afternoon travel to the famous Isla del Sol by motor launch. Overnight in a traveler’s hostel in Challapampa. Day 5: Spend the day hiking to the southern end of Isla del Sol with the high Andes stretched out in panorama. Visit ancient ruins and ceremonial sites, stop for a game of soccer or Frisbee, and spend the night in a hostel in the village of Yumani near the crest of the island’s main ridge. Day 6: Boat back to the mainland in the morning, take a vehicle shuttle to the town of Sorata at the edge of the Cordillera Real Norte. Trekking orientation and equipment check. Overnight in a grand old hotel in Sorata. Day 7: Begin extended trek and mountain section. Dropped off by 4x4 vehicle in the tiny village of Jankhouma. Overnight tent camp. Day 8: Breakfast and morning classes, trek over Korhuasini pass and descend to the valley of the same name, camping near the hamlet of Cocoyo. Evening social visit or soccer game. Overnight Tent camp. Day 9: Continue our trek through the Cordillera by traversing Sarani Pass, nestled between snow-covered peaks. Overnight camp at Chocolpaya. Day 10: Traverse Keakeani Pass at 14,700 feet. Overnight camp at Negruni. Day 11: Continue trek on to Lloco-Lloco pass at 15,500 ft. Overnight tent camp. Day 12: Built in class day/rest day though the date and location is not fixed. Day 13: Depart for Jankhokota Pass at 16,300 ft. and descend in the afternoon to Laguna Khotia. Overnight tent camp. Day 14: Continue traverse of the range to Laguna Ajwuani. Overnight tent camp. Day 15: Traverse Lanchallani and Jurikhota passes, both at 16,000 ft. Overnight tent camp. Day 16: The group nears the end of its Andean traverse by crossing the highest pass of the route at 17,050 ft. After descending to Laguna Chiarkhota camp is established from which activities will be based for the next several days. Overnight tent camp. Day 17-20: Spend the next few days teaching and practicing the skills required for ascents of nearby Pico Ilusión (17,500 ft.) and Pequeño Alpamayo (17,620 ft.), or other appropriate peaks. Overnight tent camp. Day 21: Break camp and hike out to La Rinconada road head. Vehicle transfer back La Paz. The afternoon is spent cleaning up, cleaning gear, program evaluation and orientation, e-mail, and a big meal out. Overnight hostel, La Paz. Day 22: Descend from the high Andes to the lowlands. Drop into the Amazon basin by vehicle transfer to the village of Guanay on the Kaka River, one of Bolivia’s most important and largest rivers and a natural highway for transportation through the Amazon. Overnight hostel, Guanay. Day 23: Board motorized dugouts and travel the river to the jungle village of Myaya. Be on the lookout for the many wild animals that live along its banks including capybara, tapir, caiman, giant anteater, collared peccary, howler and spider monkeys, bats, hawks, fish eagles, egrets, kingfishers, Blue Morpho butterflies, Blue and Red macaws, and many others birds. Overnight tent camp, near village of Myaya. 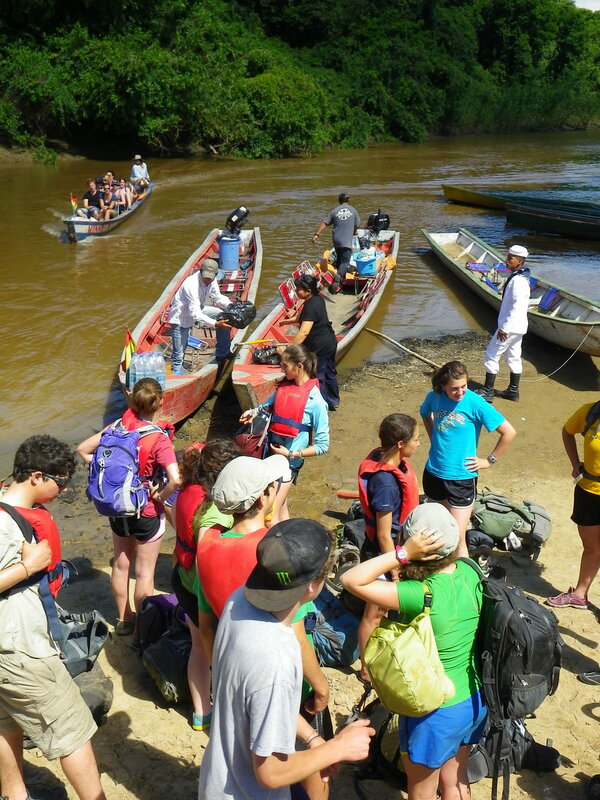 Day 24: Continue jungle journey by motorized dugout to the river town of Rurrenabaque and overnight in a traveler’s hostel. Day 25: Depart Rurrenabaque in 4x4 vehicles prepared for rough, dirty travel. It is common that groups need to pitch in to clear logs from the track and push vehicles through muddy sections on the journey to Santa Rosa de Yacuma. Continue along the river throughout the afternoon by motorized dugout to our jungle camp for a special night hike accompanied by local indigenous guides. Day 26: Unique opportunity to explore the jungle hiking through flooded plains and forest seeking views of the local fauna, including the elusive Anaconda. Return to camp by sunset for an evening fire. Day 27: Awake to the songs of birds and chatter of monkeys. Navigate the river or hike in the jungle forest again before returning to Puerto Yacuma and the Rurrenabaque airport for our flight to La Paz. Overnight in hostel, La Paz. Day 28: Transfer to El Alto airport and international flight out to U.S.A. Begin international flight. Day 29: Arrive final destination. We design and lead educational wilderness and leadership programs. Our educational programs work with high schools, universities, camps and other organizations to provide logistics and risk management oversight for the institution's established program or through our own outdoor and leadership curriculum. Our philosophy is one aimed to advance outdoor education and conserve the wilderness classroom, serving as allies for the surrounding parks and communities. We create a learning environment that pushes students out of their comfort zone in a way that is manageable. Our intent is for students to gain enthusiasm, courage, and techniques to implement positive change moving forward. We want students to gain the enthusiasm and knowledge so that they may positively impact our world and be dreamers and doers in their own lives. Please contact us for more detailed information of our educational programs.